Torrential rain and lightning storms considered the worst in 115 years in southwest China's Chongqing Municipality have killed 10 people, destroyed thousands of homes and cut roads and power supplies since yesterday. 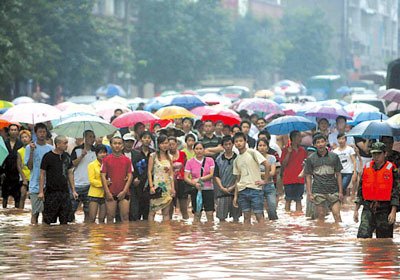 About 113,100 people were evacuated from their homes, Xinhua news agency reported. Five people were missing. In the city's urban areas, rainfall reached a record of about 266.6 millimeters, triggering landslides and mud-rock flows in 22 of its 40 counties and districts in the southern, central and western parts while the temperature dived 7.8 degrees Celsius, the Oriental Morning Post reported. The National Headquarters on Inspection of Flood Control and Drought Relief has enacted a third-level emergency plan and sent a work team to Chongqing to cope with flooding in the nation's southwestern areas, according to Xinhua news agency. The country has four levels of plans for floods with the first level the most serious. A total of 41,672 lightning bolts were recorded in Chongqing from early morning to 4pm yesterday, causing 48 power lines to go down, more than 300 power faults and more than 200 fires across the city, the report said. The heavy rains also destroyed more than 10,000 houses and ruined 118,060 hectares of crops, causing losses of more than 863 million yuan (US$114.1 million). Traffic in the city was almost paralyzed due to the rain as thousands of cars and buses were trapped on roads submerged in water and most gas stations closed for safety reasons, the report said. Almost all trains coming in and out of the city were canceled due to alerts about landslides. Chongqing's only light railway had to suspend service for about three hours after its electric power system was experienced problems when a tree, hit by lightning, was knocked down, the report said. There's no relief in sight. More rain was forecast to fall in the city in the next three days, the Chongqing Meteorological Administration said, which released its first red alert for rainstorms this year yesterday. China is now struggling to handle rainstorms in Sichuan, Guizhou, Anhui, Hubei provinces, as well as the Xinjiang Uygur and the Inner Mongolia autonomous regions. 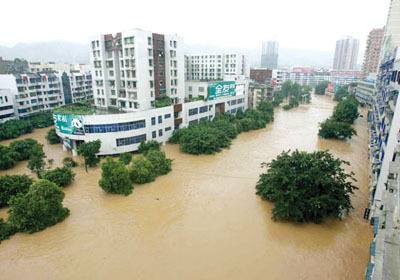 Jiangsu Province, downstream of the Huaihe, is also expected to experience the worst flooding since 2003, according to previous reports. Premier Wen Jiabao asked the nation to prepare for the flood situation to worsen as the country enters the main rainy season. The central government has allocated 232 million yuan to help flood-hit areas around the Yangtze River and the Huaihe River.